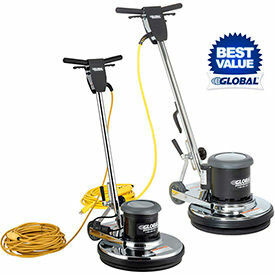 Floor Machines Are Used For Cleaning Carpet, Hardwood Floors, Ceramic Tile And More. 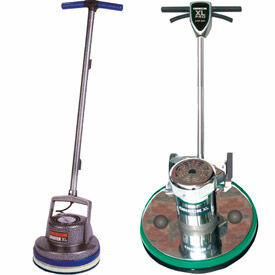 Floor Machines provide reliable cleaning power in a variety of commercial environments. Bissell® Lowboy Floor Machines are made with a 10.8 amp induction motor with orbiting transmission that runs at over 1725 orbits per minute. 19" apron with optional vacuum connections controls and collects sanding dust. Safety-enhanced non-conductive dual triggers eliminate shock potential, while the safety interlock switch prevents unexpected startups. 5" non-marring transport wheels ensure easy transport. Oreck® Orbiter Floor Machine features a 1/2 HP induction type motor made using zinc and steel for lasting durability. Floor machines are made without gears, belts or motor brushes for virtually maintenance-free operation. 30' grounded 3 wire and pad holder. 13" cleaning width. 1 Year Limited Warranty.Bissell BigGreen Commercial Easy Motion Floor Machine with Tank is versatile enough to do it all. It strips, waxes, buffs, sands and refinishes any floor surface. Whether your floors are marble, vinyl, wood or carpet. Boss Cleaning Equipment Formerly Pullman-Holt floor machines are built for the professional. Heavy-weight, cold-rolled steel chassis with built in water-feed fitting. All steel triple planetary gearbox, high torque 2 capacitor motor. Includes Malish Sure-Lok pad driver and 50 foot power cord. Gloss Boss Floor Machines are UL listed imperial motor and parts. 1.5 HP, 175 rpm machines are durable workhorses. 5 year limited warranty on motor and gearbox. Easy to clean. 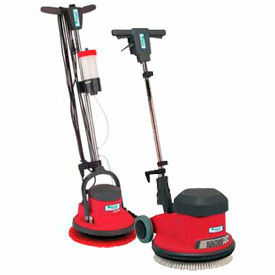 Mastercraft® Floor Machines Are Used For Maintenance And Cleaning Of Stone, Parquet And Linoleum Floors. Mastercraft® Floor Machines are solidly manufactured for long lasting durability and dependability. 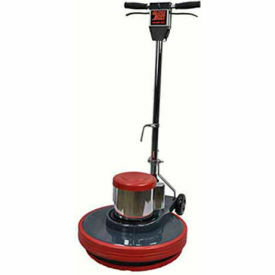 FloorMac 13 Inch Oscillating Floor Machine oscillates smoothly using user friendly anti-vibration system. Used for stairs and other obstructed spaces with 10 inch clearance. Includes cleaning solution tank that is easy to refill between uses. PowerDisc 160 Single Disk Floor Machine is heavy duty, and used for all maintenance and basic cleaning. Made with high polymer housing construction. Features one lever handle adjustment for easy operation. Torque-driven unit that is both quiet and vibration free. 17 inch brush size.